In a post-Tangled Disney, the House of Mouse has a lot to live up to. Tangled was a fantastic reinvention of the Disney Princess franchise that set the bar pretty high. Before Tangled, Disney was about to give up on any more princess movies, especially after The Princess and the Frog was a huge flop (yep, that was intentional). Tangled was a risk, and it paid off handsomely. With renewed enthusiasm, they’re exploring the Princess franchise once again. The princess movies are what my generation grew up with, so the new and future generations deserve to have the same experience. 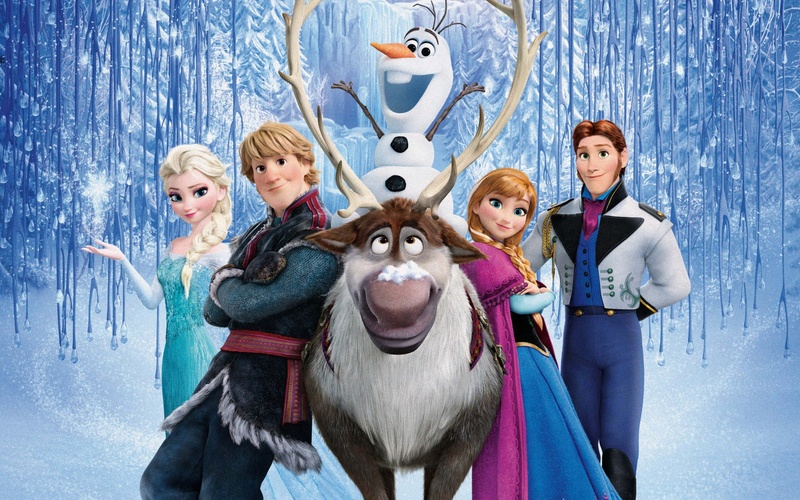 Enter Frozen, a movie inspired by Hans Christian Anderson’s The Snow Queen. Frozen comes replete with adorable characters brought to life by a fantastic cast, great music, and even a few twists and turns. It’s an incredible feature and a sure classic at that. Frozen includes some enjoyable characters beginning with the two adorable sisters that the movie revolves around. The two princess sisters, although very different, have an incredible bond that makes your heart melt. There is Anna (Kristen Bell) who is a cute little red head who just wants to have fun with her sister, Elsa (Idina Menzel). Elsa is the older sister who has a special gift of creating ice and snow out of thin air, which turns out to be a bit of a curse. After a bit of magic goes wrong their parents decide to hide her abilities and close the family off from their kingdom, while Elsa learns to control her powers. In true Disney fashion, the parents die and the girls are left to fend for themselves. During Elsa’s coronation to take over the kingdom, Anna finds her “prince charming” and they decide to get engaged instantly. Disney actually pokes fun of their classic princess movies where the girl and guy fall in love instantly without getting to know each other except for some unimportant details. The two sisters get into an argument about “prince charming” and Elsa reveals her abilities. She is run out of the kingdom by her subjects, who believe she is a dangerous witch. Elsa is upset by this, but also sees it as an opportunity to truly be herself and harness her abilities. Elsa goes through a transformation as her attitude about life changes and she becomes the girl she always wanted to be. This part is very interesting. In an incredible song performed by Idina Menzel, “Let It Go”, Elsa has run away and she is discovering herself. Idina Menzel performs it with such emotion that even in a cartoon the sheer talent tugs at your heartstrings. During this song Elsa starts to change and mature…really…mature. He clothes and hair change become more seductive and her walk is noticeably more flirtatious. The audience could have come to the same conclusion without all of the vamping. Anna sets off to find her sister and bring her back to the kingdom. She enlists the help of Kristoff and his trusty reindeer Sven. Kristoff is a quirky ice salesman who is socially awkward and outdoorsy. He helps Anna find her sister and they even develop a little love connection. On they’re way they meet the fantastic Olaf. Olaf is a snowman that Elsa created with her abilities. Voiced by the hilarious Josh Gad, Olaf takes this movie to the next level. He makes tons of snowman puns and his aloof approach to everything keeps you laughing straight through till the end. He even sings a great song, “In Summer” which is about how he is a snowman who can’t wait to experience summer in all its greatness. The movie culminates with a surprising twist and a lot of intense drama. The movie is stacked with tons of great songs. With amazing performances from the cast, the entire movie could go straight to Broadway with all of the songs and talent. Disney is clearly back on top of its animation game. They don’t have to rely on Pixar to save them anymore. I can’t wait for the next one. In the meantime, I’m seeing Frozen again. ← “It’s a Wonderful Life” at Cable Car Cinema: Christmas Classic or Overrated Oldie?